Mashable, one of the top media outlets covering the web and its impact on global society, posted a terrific piece on how the social web is effecting real change in how doctors and patients engage and communicate with each other. Patients have long used the web to seek out information on health and medicine. Personally, I think search was invented so we could look for how to figure out why [insert body part here] started hurting. So I wasn’t surprised to see that there’s been a more than 30% rise in web usage by US physicians in the last eight years. My only question is this: why are so many doctors and other healthcare providers still reluctant to participate in the online conversation? It’s true that, due to HIPAA compliance issues, healthcare has to use some real discernment when communicating on the web. Yet even those practices who are nervous about putting themselves on Twitter or Facebook could get some serious mileage out of building a secure patient portal to facilitate how patients schedule appointments, renew prescriptions, ask questions, report numbers (blood sugar, etc. ), and review their records. Yes, the web can make your activity transparent. However, a secure portal helps doctors, and their teams, be even more effective at helping their patients. Adding a social media presence to help educate the community at large is a good idea, too. Not engaging online can cost a practice patients, and revenue. If you don’t know how to go about building an online presence for your practice, we can help. Need a secure patient portal? We can help there, too. I attended the annual conference of the Virginia chapter of HIMSS (Healthcare Information & Management System Society) in Williamsburg this past week. I hoped to both make some good connections, and to hear some ideas and lessons learned from health IT practitioners who had seen first-hand how Electronic Health Record (EHR) deployment worked in the real world. I succeeded on both counts. The 2-day session program started with the CEO and CMIO of Sentara Healthcare sharing their experiences in deploying EPIC (EHR) and MyChart (Patient Health Record/PHR). Dave Levin, Sentara’s VP of Medical Informatics, reported that “I feel like I’m practicing at the top of my game” is something he’s hearing from many Sentara doctors and clinicians since EPIC implementation. Deploying EHR technology is driving a move beyond just analytics to knowledge management – however, Levin says that many primary care physicians will struggle to make the business case for EHR, while specialty practitioners feel that neither the carrot (federal incentive payments) nor the stick (reimbursement reductions for practices who don’t deploy) are big enough to drive EHR adoption. This was the first time I heard a reference to “gimme my damn data” from the platform – kudos, e-patient Dave. One of the critical pieces of building a technology-driven healthcare delivery system is the ability to exchange medical records seamlessly across the provider and payor spectrum – each state is building a Health Information Exchange (HIE) in service of HHS’s Nationwide Health Information Network (NHIN). Mike Matthews, CEO of MedVirginia and one of the drivers of the development of Virginia’s HIE, was next on the platform. The process is still underway to build out a state-wide HIE, but Matthews offered some positive news from one large Virginia healthcare provider who saw a $2M increase in Social Security Administration reimbursements after implementing e-health initiatives. A panel of CMIOs took the stage to offer their EHR deployment war stories – one of them made the observation that “we are all Henry Ford”, meaning that every HIT leader was creating a healthcare version of the first Model T assembly line. Usability is a key issue, and the panel agreed that “good enough” needs to be the first milestone in driving EHR adoption. The ambitious time-line for that adoption, combined with the economics of deploying systems and herding the multiplicity of cats who will use them, makes the case that “good enough” will have be good enough for the initial phase of e-health. They also observed that “meaningful use” has to translate into “better care”, and that payment reform (which in this writer’s opinion is a better name for what’s now being called healthcare reform) must make quality of care the key incentive to higher payments. Most of the CMIOs on the panel were family practitioners – the front line of healthcare. They all agreed that HIT usability was in conflict with meaningful-use criteria box checking, and there was more than one reference to the need for tort reform to put the reins on “defensive medicine”. A culture of disclosure has to become part of managing risk. This session included another reference to “gimme my damn data” from the platform – go e-patient Dave! The program continued with input from Dana Moriconi and Leah Wacksman of VCU Health System, HIT expert nurses who have seen the convergence of IT and clinical practice driven by “unit champions”, evangelists for the process who facilitate IT adoption on the front lines of healthcare. Virginia’s Secretary of Health & Human Services William Hazel, an orthopedic surgeon who has joined the McDonnell administration to help turn statewide health into an economic advantage, was up next. His paradigm for meaningful healthcare reform in Virginia: improved access, increased value of care, rigorous safety protocols, all combined to enhance both patient and physician satisfaction. The “medical home” is a catch-phrase of the moment for primary care – Dr. Stephen Morgan, the VP of Medical Informatics of Carilion Clinic in Virginia’s Roanoke Valley, presented a case study of Carilion’s development of a patient-centered medical home. Focusing on diabetes, hypertension and asthma, Carilion’s Family Medicine group in Vinton VA achieved one of the 1st Level 3 certified medical homes in the nation. HIT enables much of the connected care that is a hallmark of the patient-centered medical home, helping develop the relationship-based care that increases treatment effectiveness and patient health. Wrapping up the 1st day’s sessions, VCU’s Professor of Biomedical Informatics, Jonathon DeShazo PhD, talked about “New Last Mile”, using patient health records (PHRs) and patient portals to build deeper connections between healthcare practices and their patients. The challenges for PHRs and portals include authentication – is this really the patient? – and determining what data the patient can access without needing interpretation from a medical expert. Sessions on the last day of the conference kicked off with an address by Delegate John O’Bannon, a neurologist who is also the representative of Virginia’s 73rd Assembly District. Dr. O’Bannon echoed the call for tort reform first heard in the previous day’s CMIO discussion, and floated the idea that the requirements for employer-based healthcare insurance might lead to the end of health insurance tied to employment, given that the $2,000 per employee penalty for failing to provide coverage to employees was significantly cheaper than the coverage itself. Mark Blatt, an MD who leads Intel’s global healthcare strategy, presented some interesting conundrums created by the rise of cloud computing in healthcare. The efficiency and agility afforded by cloud services raise significant risks on the security and enterprise support side. Plus, integration and on-going operations can bring unforeseen costs to cloud-deployed platforms. His recommendations included separating data into private/public silos, with the private (clinical data, mission critical applications, ERP) staying on client-controlled servers and the public (billing, knowledge management, hosted web apps) going into the cloud. Joe Becht of Deloitte & Touche LLP took the podium next to give an overview of the impact of reform on the healthcare revenue cycle. In his view – and I agree – ICD10 will have a huge impact on data management costs for healthcare facilities, from small practices to large systems. Quality will become a payment criteria, and hospitals will become the bank in the blended-payment model of the Accountable Care Organization (ACO). The outreach director of Virginia’s HIT Regional Extension Center (HITREC), Jann Anderson, gave a report on the effort to help smaller practices, rural clinics, and community health centers across the state implement EHR in their facilities. HITREC, with the help of a federal grant and in collaboration with the Center for Innovative Technology, offers providers help in both selecting EHR technology and navigating meaningful use. The event wrapped up with a CIO roundtable featuring the IT leaders of Inova, Bon Secours, Valley Health, Riverside/Sentara, UVA Medical Center, and Rockingham Memorial. All the panelists have deployed EHR technology in their organizations and are now navigating meaningful use, how that will drive quality and continuity of care, metrics, data management and security, and reporting. They all noted that MyChart is driving patient engagement – giving patients their “damn data” (thanks again, e-patient Dave!). On the clinician side, desktop virtualization and QuickTap ID badge login/logout systems are making for both clean platform management and good usability. iPhone apps and EHR mobile integration, in combination with MyChart, are helping facilitate adoption by clinicians and patients, breaking silos of care. The next goal: using IT to help move beyond meeting needs to anticipating needs, on both the clinician and patient side. Laudable, and achievable, as long as all the participants hold on to that collaborative vision. Great conference, with great content and great conversations. Thanks, VA HIMSS – I’ll definitely be at the next one! I’m a health activist in addition to being a healthcare communications & IT consultant. I’m passionate about putting patients, clinicians, pharma, device manufacturers, and every other part of the medical care delivery system in the same room, shaking well, and seeing how that can improve healthcare. A great opportunity appeared. I said “yes” – follow this link to read what happened. Not true – doctors and other healthcare providers can use social media tools without risking arrest by the HIPAA police. The important caveat: do not engage with individual patients about their care. If they ask you a question about their medication on your practice’s Facebook fan page, ask them to contact you through your practice’s patient portal. Not true – a 2008 Deloitte survey revealed that over 70% of patients (all patients, not just those 18-40) want online access to their doctors. A 2009 Pew Internet Research study showed that 83% of all US adults online regularly seek out healthcare information on the web. 24% of patients have sought out information on medical care review sites. Tell your own story, don’t let Angie’s List do it for you. Not true – it takes 20 minutes a day to manage social media for a small practice group. Make it a team effort by including your nursing team and your front office staff in your social media strategy. Develop a social media plan, a good social media policy that includes clear “rules of engagement”, and build a passionate patient community around your practice. Social media IS media today. Use the power of social media tools to educate your patients, your community, and your peers. Look for our white paper later this month, Social Media, Healthcare & HIPAA: How the Web Is Changing the Culture of Medicine. Your patients are talking – are you listening? I had the pleasure and privilege of talking to Ted Eytan and Trenor Williams of Clinovations last Friday about healthcare IT. Here’s the first edition in what will be a monthly series of conversations about the intersection of healthcare, technology and communication. Ted and Trenor both have solid on-the-ground experience as physicians and technology consultants in healthcare. Their insights and observations can help both providers and patients get, and give, better care. I was particularly heartened to hear their recommendation to get patients involved in technology initiatives as early in the process as possible. Give it a listen, and please share any comments – thanks! 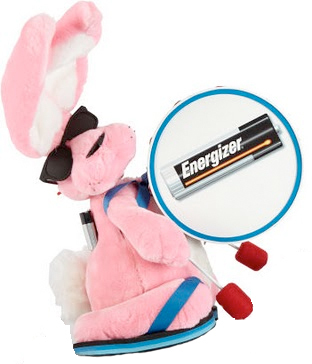 Let the Energizer Bunny be your model. You’ve probably seen the commercial… the Energizer Bunny standing in the glow of UFO lights, looking ever so cool in his (her?) sunglasses, saves the day by beating his drum harder and harder until the spaceship powers up and is successfully on its way to take ET home. There’s no doubt providers are being squeezed from all directions – government regulations, pushback from insurance companies, recalcitrant patients. No one is quite certain how the healthcare changes are going to shake out, but it’s clear that business as usual isn’t going to continue much longer. That spaceship is about to crash land. Instead of lamenting the good old days, start banging the drum to energize your practice/business. And keep on banging it. Too often a practice will try something once or twice without results. So it stops. Try something else awhile. Nope, that didn’t work. Try something else. Compounding the difficulty, marketing is assigned to someone in the office who, besides not having experience in marketing, has many other things to do every day. It’s rare that a single marketing activity will have big results, but a professional, coherent, long-term, multifaceted strategy almost always brings a lift. View more webinars from Mighty Casey Media LLC + WellCentrix LLC. Social Media + Healthcare: Adopt or Die? “Die” in the post headline is admittedly hyperbole – but it’s also simple truth. If you’re in healthcare, and using HIPAA as the reason not to participate in social media, are you driving a stake through the heart of your brand? Patients are using social media to manage their health and health care. The e-patients movement, sites like Patients Like Me, and the rising demand for PHRs (to go along with the EMRs mandated by the Health Care Reform Act) are all internet-famous. The Mayo Clinic and Cleveland Clinic have both embraced social media as a community and brand-building tool. Smaller hospital groups like Bon Secours have done the same. Women make pretty much all family healthcare decisions. Women are also a huge portion of the social media audience. Not participating in the discussion = silence. Social media and mobile apps for healthcare are on the rise, for both patient-to-provider and provider-to-provider communication. Not participating in the discussion = silence. Health care providers who don’t work to understand how they can use social media to engage with their patients and their communities are missing the boat. Your patients are talking about you. If you listen, and join the discussion, you’ll see some great results: more patients, more revenue, more recognition. Medicine is a science, based on more science. Practicing medicine is an art. Many medical schools are showcasing a different kind of art from their doctors, nurses, students and staff. A recent story in the St. Louis ‘Post-Dispatch’ highlights the paintings, drawings, poetry and more that have been produced as a means of expressing the joy and sometimes deep frustrations of their daily work life. What a wonderful way to enhance the humanity of our caregivers. Is there a literary/art journal at VCU-MCV or other med schools in Virginia? I’d like to hear about it. We’ll be sharing our insights and discoveries about healthcare communication, marketing, IT, patient engagement, and more here on the WellCentrix blog. We’ve got a wide array of talent, and a deep pool of thought-leadership. First up: a cautionary tale about hospital PR. Context: Laguna Honda Hospital (San Francisco) is facing allegations of misuse of a fund intended to help patients pay for treatment, including that hospital staff had used some of the fund to pay for meals and airline tickets for themselves.